We have in this election a Government Party vs. an American Party. Giving explicit control over the election to the Government’s new domestic security force is the fruition of the Civil Rights Act’s Long March through the Constitutional federal system. In the federal republic described in the Constitution, we are primarily citizens of our States. There is no elective position that is voted for by generic Citizens of the USA. The take over of elections by the Orwellian abomination named “Homeland Security” is the final usurpation of the Government Party over America. THIS election is between the Government Party and an American Party. And the feral gub is to be the referee? How stupid they think us to be! HRClinton represents the entire ecosystem that has evolved in Washington DC since WW2. DC before WWII was a smallish southern city centered around its one industry: the Federal Government. Until air travel became as commonplace as railroad travel, and before air conditioning, DC was an isolated, hot humid town that appealed to few Americans . Its stifling summer was an occupational hazard. When the Federal government had little to offer private enterprises, “having a man in Washington” was not considered necessary. When under guise of the Civil Rights Act the Federal government empowered itself to set the terms of all private business it was as if a crack in the sea floor created a Thermal Vent. This energy source gave rise to its own ecosystem. DC grew commensurately with its claiming more and more control over private enterprises. From EPA to OSHA from EEOC to IRS the Federal government created webs of power that ramify like a second vascular system into the smallest niches of the economic ecosystem. The Federal government was to be a neutral venue where legitimate special interests would jostle one another like the uncountable molecules in a gas. All internal chaos is summated into a stable pressure. When the numbers of people employed in DC and in its worldwide web reached a critical mass they became an interest in and of themselves! This is the Government Party: consisting of the Democrat Party in full and the insider cronies of the GOPe. This election is not between the Dems and GOP! No. It is the first election between the reigning Government party and the rising resistance! It may well be the last if HRC wins. Elevating the Department of Homeland Security, a paramilitary domestic police force to “secure” this election is to put a pack of wolves to guard a sheep pen! The NY Times today (July 17, 2016) ran an Op-Ed by a certain Peter Wehner, who presumes to be a long-suffering GOP apologist. His was a voice of rebuttal to the constant chorus of libels and lies promoted by the mainstream media. And of course the NY Times is at the head of any list of leftist propaganda organs. So it is with high irony that they chose to publish this Sunday Op-Ed. In fact this staunch defender of the GOP has so often appeared in the Times Op-Eds that they should hire him as the Official House Republican. Despite the title he would still be referred by the J-school geniuses around the Perrier water cooler as the the “GOPher”. FOR my entire adult life I have listened to the invective leveled against the Republican Party by liberals: It is a party sustained by racist appeals, composed of haters and conspiracy nuts, indifferent to the plight of the poor and the weak, anti-woman. Now, I do know the feeling he is expressing. I am a Jew who defended Mel Gibson when his film The Passion evoked charges of anti-Semitism. No, no, I insisted, the film cast the entire Jerusalem establishment as culpable in its rejection and crucifixion of Jesus. So when old Mel was picked up DWI and was videoed giving a drunk exhortation that demonstrated his Jew-hatred, I felt the fool. But this is not that. Unlike the Gibson rant, nothing that Mr. Wehner rebutted is the case with Donald Trump! Same with the simple truth that we cannot afford the social welfare programs we now fund, let alone any new ones. With your Lefty-Lu secret decoder ring you can read “I support starving and denying health care to said minority group”. So …that’s it with a party sustained by racist appeals. Sorry Wehner. • A party of “haters”: Again an example of Leftist telepathy. If it is my principle that governments at every level lack a legitimate role in the transactions between rational adults, then “I hate” transgendered folks because I will not use government power to coerce private businesses to accommodate their peculiar needs. Again only psychic Leftists can perceive that ultra-sonic dog-whistle that is allegedly used to encode “If elected I will make it illegal to be a transgendered person!” Why? Because “Like you, my fellow Americans I hate queers!” Oh Wehner! • “Conspiracy Nuts” two words “twenty-eight pages”. The deliberate cover up of Saudi involvement in 9/11 has been kept from us these fifteen years. The “vast right-wing conspiracy’s” persecution of the Clinton Crime Family is hardly a lunatic’s ravings. And the actual facts surrounding Obama’s birth may never be determined. His social security number is in a series of numbers used for births in CT at that time. Not Hawaii! Who funded the young slacker Barry Sotero? • Indifferent to the plight (does anyone other than Leftist rhetoricians use that word?) of the poor and the weak. Uh oh, still another presumption of the clairvoyant SJW. (No, not “single Jewish woman” as I had first guessed, but “Social Justice Warrior”!). If one understands the theory of the Social Contract it is self-evident that we create government in order to protect our private property, our lives and our liberty. The Left claims some share of ones private property is somehow “owed” to those who are in some official plight. The illusion of legitimacy iscreated by legally defining some arbitrary income level as a “plight”. It is made to appear legal and official as private property is taken away by a third party. And it is their beneficence (the third party’s of course) to donate the “surplus” to alleviate “official plights”. A more honest system would do away with the middle-woman (are there any men left in the middle management of Public Welfare bureaucracies?) and have anyone who feels “plighted” assess how much of the “donor’s” wealth is required to remove said plight. And of course he would be “entitled” to it. But if one states that “a need is not a claim” she is instantly charged and convicted of bigotry! Merely speaking truth to self-righteousness is a Hate Crime. Charity is a virtue. Theft is not. Charity is a choice. Other than those physically incapable of providing for themselves, no one is owed anything. Standing for Private Property does not make one uncaring. Most people will be more generous to those who do not come with a gun making demands based on their “plight”! • Anti-Woman is what those who believe fetuses are private property call those who do not. It is amusing in a sick way that those with the least sense of other’s private property are rabid about this one particular item. That which ought be private property is not. That which ought not be, is! This perhaps is corollary to a major principle of Post-Modernism: That which was a matter of morality is a matter of taste. And that which was a matter of taste is now one of morality. How in the world does Mr. Wehner accuse Donald Trump of these “thought-crimes”, “thought-crimes” that are defined by the Left? No, the question is how can he parrot Leftist talking points without acting the fool? Answer: he cannot. The selection of Trump by the primary voters has made Wehner repent of his defense of the GOP? Lead follow or get out of the way! The American (and British) people have had a belly full of elitists spinning intilekchuel rationales for irrational national suicide. as the above, without one example in support of such vile claims is par for them. What dripping elitism! We are merely “party guests” who, took over the party? Why are we so despised? I can understand his position without castigating his morality. But as with the Left, here is an inability to fundamentally disagree with someone without attacking their motives. I suspect that under most of Wehner’s hate speech is an idealistic belief in Free Trade. If he supports that, fine, I do not. I am not more moral than him because of that. I presume he is not in favor of the furthering of the Rust Belt, or the marginalization of English-speaking American-Americans. He has his ideologic reasons for Free Trade corporate globalism. Although I suppose it is possible that he is selfishly fixated on the rising value of his stock portfolio. But I am not clairvoyant. The ideologues claim Free Trade is corollary to liberty. Yet, the Constitution gives Congress the power to set trade policies with foreign countries. So, if he believes that national borders are irredeemably illiberal and that goods and labor must pass freely it is he who is a radical. The Party of Lincoln was the Party of Trade Protection ! So who is the guest of whom? Free Trade has caused the destruction of the middle-sized industrial cities of America. And with them went the well-paying jobs that allowed the average man to own a home, support a family and save for retirement. A man today without college education in the arts of rhetoric which is what most of a post HS education consists of has little chance of a “middle class life”. The full time commitment and ambition of the professional is not for everyone. Some folks would rather have a life. The Black underclass has paid the price. So an idea, the actualization of which will have an adverse effect on a targeted minority might well be said to be Free Trade. But of all the arguments against Free Trade I have yet to hear anyone claim it to be based in racism! Why the hell not? “Woman’s issues” is only your side’s dog-whistle. It is all about abortion. Actually Trump is not a Bible-thumping pro-lifer, not an absolutist, from fertilization to birth. Would you have been equally appalled by every other GOP candidate? They all had to kiss the pro-life ring. But which candidate would Wehner have supported? It is crass hypocrisy to spread the Democrat lie that Trump is anti-woman! If Jeb! was running and he made strong statements against abortion would Wehner have called him “anti-Woman”? Intolerance. Too much is said of tolerance as a virtue. In immunology a state of tolerance means no recognition of what is non-self. AIDS is a state of tolerance. Why should Americans tolerate that which NO NATION IN HISTORY has tolerated? I can think of no nation that has voluntarily allowed a migration of demographic proportion. 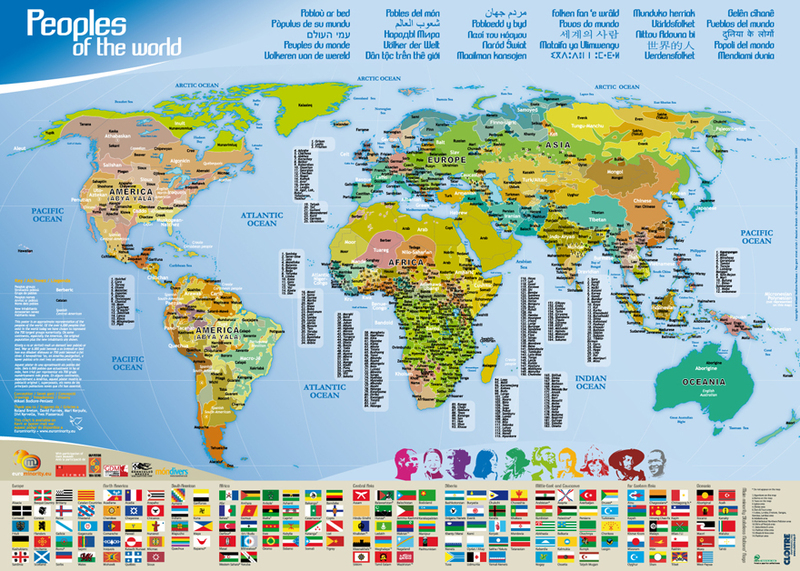 In history, nations were displaced by invaders after they no longer could hold them off. Have we lost some war at our borders? Why must we tolerate America becoming Latinized? Latinos have a pre-modern culture. Catholic majority nations are often poorly governed, and impoverished. Most American Catholics are descended from Catholics who might just as easily have migrated to Latin Argentina or Chile. But they recognized that it was America that held a future for their children. Why? So too in Muslim majority nations, when given a chance the people will emigrate to a Western nation. And within the West it is the Protestant areas in northwestern Europe they truly seek. With Britain the golden isle, the ultimate destination no wonder BREXIT. This is not to say that the modern religiosity is relevant. This is not to say Americans are all Protestant! I am not. We are not. But, the Middle Class culture of the Anglo-American world is where we began. Our culture is steeped in Reformed Protestant ethics. We are as fish in its water. Why should we have immigrants foreign to the main thrust of our history and culture come here in numbers that will render us minorities in the lands our fathers carved out of the wilderness. Oh but we cannot say that without some caveats to the Indians. Let it be understood once and for all, European diseases destroyed Native American societies. We had no superiority over them. The force that allowed the timing of plagues and peoples laid out a highway into this New World. But what makes anyone think that we earned the ease and wealth we take for grante. If not for the “just-in-time” coincidences there’d be no America. Too many take it all for granted. The Don asks “Do we have a country or not?” He means “a nation”: are we a Nation or not? If so, there is an American culture. There is an American historical narrative. There is an American literature. A rule-of-thumb: when “American” is placed in quotes beware the Post-Modern elitist. David S. Cohen says “I teach the Constitution for a living.” Can’t help but think of John 3:10 Yeshua answered him, “You hold the office of teacher in Israel, and you don’t know this? Mr. Cohen has no business teaching the Constitution, neither by virtue of knowledge nor possession of a mind capable of rational chains of thought, i.e. logic. IOW we do not cherish the 2nd Amendment because it is included in the secular writ of the Constitution! We cherish the Constitution because it guarantees that our government is ours! Unlike all the rest of the governments in the world at that time, ours is conceived by the People, for the purposes of the People, and belongs to the people. This Nation has created its own government. Looking back across the Atlantic the framers saw Kingdoms, and Tyrannies that presumed to own the nations they ruled. Not so here! Our Nation, America owns the government. In fact there was a Nation before there was a Constitution! The nation established a government. In the philosophy of John Locke we Americans made an explicit social contract. Locke wrote of implicit social contracts, as theoretical outgrowths of his concept of human nature: as being capable of spontaneous self-organization based upon rational individuals surrendering some small portion of the absolute liberty that would be present in a “state of nature”. For it is rational to give up some small part of liberty in order to establish a society that would recognize the right of private property, freedom from coercion, and support a common defense against criminals, would-be tyrants and invading nations. David Cohen is wrong when he presumes that we who stand by our God given rights do so because we believe the Constitution is revealed wisdom, from on high. His examples like the Articles and Amendments dealing with the Vice-President selection, or how the Senate is to be chosen are intramural affairs. They do not effect the scope of the Constitution, but merely alter how it functions in those areas to which it is limited. Those are issues contained within the fabric of the Constitution. They do not establish or protect the Constitution itself. It is the Second Amendment and the rest of the Bill of Rights that protects the Constitution, or better: protects the nation from a government that exceeds the scope to which the Constitution allowed it. I had planned to demonstrate Cohen’s faulty grip on American history as well as his poor reasoning. Lets see how it goes. If it becomes too tangential I will let it go. Every high school graduate once knew that the 3/5th’s rule was a compromise between the Free States and the Slave States. Since slaves obviously wouldn’t be voting, including them into the Slave states’ population served to increase the numbers of Representatives and Electoral College members it would have in the Federal Government. The slaves should not have been counted as any part of a person. Since the slavocracy treated slaves as chattel property it was no different than a demand to count horses towards a state’s population in terms of electoral power! If David S. Cohen is unaware of this concept it is impossible for him to be a teacher of the Constitution. But far worse than a fool is a deliberate liar who knows the truth but seeks to hide it or twist it to fit his agenda. No. No way is Cohen unaware of the history of the 3/5th’s rule and its meaning. Seems as if I cannot let it go. Paragraph upon paragraph of flawed arguments based upon faulty factoids roll down the page of Rolling Stone. We get it. The founders were deeply flawed. And would the David S. Cohen of 1789 be a snide indoctucated rhetorician or a hunchbacked bookworm at the local Talmudic study hall? Surely this 1789 version of the brilliant teacher of the Constitution would have a rather constricted and provincial worldview. But at least one of ancestors got sick enough of the musty book smells and occasional pogroms to sell everything and take boat to the New World. I think that the great Abrahamic grandparent who boldly went forth from Ur would smack young David upside his head! I am at a loss to read that the issue of equal rights for women has not been fixed. It is also presumptuous to glibly describe the Senate as a flawed institution in that it is “land based”. I had to click that link to even know to what he referred. Turns out that this “teacher of the Constitution” is either ignorant of the Connecticut Compromise or chooses to not teach it. Anyone with a fleeting acquaintance with the debates and issues of the Constitutional Convention would know that in the Framers’ mind was the fear of democracy untrammeled. The term “democrat” at that time was pejorative. The Framers, unlike our “teacher” were extremely well read on the history of republics; from Greece to Rome to the city-states of Florence and the Cantons of Switzerland. Their bête noir was a popularly elected tyrant. The masses, being uneducated, and thus defenseless against clever rhetoric are vulnerable to being manipulated by power-seeking individuals. Whether the motive is “altruistic utopianism” or naked corruption majoritarianism is a gateway to tyranny. The House of Representatives was where popularly elected men met to initiate any spending bill. This branch was closest to the direct will of their constituents. The fear of mobocracy prompted a more sedate Senate. Originally the Senators were similar to ambassadors from their state to the Federal Congress. They were to be creatures of their State Legislatures: selected by their State Government and Governors and sent to Washington DC. The Senate thus functioned as a brake on the popular enthusiasms that could sweep through the masses. Since each state had two Senators, the smaller states such as Delaware, and Rhode Island were protected from having their voices drowned out in the proportional numbers of the larger states in the House of Representatives. Put simply the two functions of the Senate were to represent the States as the semi-sovereign entities that existed prior to the Constitution and to oppose untrammeled majoritarianism. In 1914 the Progressive Wilson shepherded through the 17th Amendment that removed from the State governments any role in the selection of Senators and made them also popularly elected. And apparently this further erosion of the levy designed to channel the majoritarian tide is not enough! No, now the complaint is that the less populated states (mainly rural, mainly NOT the magnet for immigrants, mainly Christian, mainly conservative) have the same representation in the Senate as the more populated liberal states such as California, New York, etc. DOH! That was why the Framers, deeply flawed as they were, created a bicameral legislature in the first place! As one can see Cohen’s flawed arguments are built upon piles of stinking misinformation. Can I muster the strength to read and comment on another of his paragraphs? See below. If nothing is below I have had enough. Not so fast. Most defenders of the 2nd Amendment believe that it is not merely the right to bear arms that is threatened, but it is the right specifically given in the Declaration of Independence of the citizens to rebel and overthrow a tyrannical government. It seems that the more the government acts tyrannical in some ways the more the urge to disarm the citizenry. Yes, one citizen with a semi-automatic can conceivably in conjunction with like-minded local citizens in a militia stand up against a Federal Government that has thoroughly militarized itself against the people. When Federal paramilitary units of the Department of Agriculture (of Agriculture??) roll up in armored Humvees wearing Kevlar and carrying fully automatic weapons to bust a dairy farmer selling unpasteurized milk, the ability to stand up to that must not be dismissed. Notice whenever a mass shooting occurs the Gun-Grabbing machine is ready to roll. Within hours, pre-written speeches, resolutions, and all manner of hyped outrage are unleashed by the lackey-media. None lackier than RS! By God that sounds like treason! Any University teaching radical overthrow of Constitutional limited government should be banned from being eligible for student loans. Anti-Zionists that are not evidently motivated against other “oppressor” nations must be considered anti-Semites. It would seem to an observer from a distant planet that the Arab people living within the borders of Israel are the sole people without a nation state. The vociferousness of the BDS movement (to boycott, divest and sanction Israel) is often deafening. Their stridency has made Jewish students on college campuses fearful for their very physical safety. The anti-Zionists claim to harbor neither anti-Semitic nor anti-Jewish sentiment. I believe the anti-Zionists are in fact anti-Semites. The only question is whether all of them are honest with themselves about it. I propose an experiment to help distinguish between the Anti-Zionists and the anti-Semites. If the anti-Zionists are truly only opposed to what they consider the unjust treatment of the Arabs they refer to as “Palestinians” then their sense of moral outrage would be equally aroused at the “plight” of other minority populations deprived of “all important” nation state status. The “Palestinians” are not by a long shot the only minority people with aspirations of nationhood! They are the unique in that their alleged “oppressors” are Jews. The following list (from Wiki) includes those whose oppressors are not Jews. The silence on campuses and in the UN is deafening. Tamils, a majority in southern India, on Sri Lanka they are a Hindu minority in a Buddhist majority state. They are concentrated in the northwest of the island and are denied their own state. Kurds, an ancient people. Saladin was a Kurd. Some Kurds believe they are the descendents of the Medes. Whatever their ancient history is, they are a stateless people spread through eastern Turkey, Northern Syria and Iraq, and Northwestern Iran. They have been persecuted for their refusal to surrender their national aspirations. 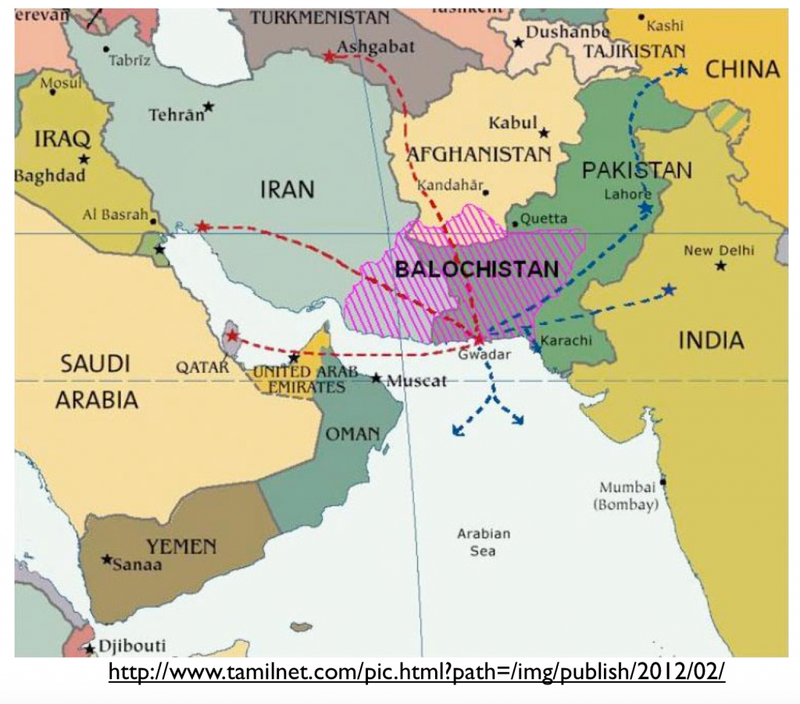 Balochi Baluchistan is that region of Pakistan that bulges westward from the Indus and separates Afghanistan from the Indian Ocean. There has been a low-grade chronic smoldering drive for independence from Pakistan. Uyghur are ethnically similar to Tajiks. They are Muslims in the far west of China. Ethnic Hans, the majority Chinese have been “encouraged” to move into this region in order to dilute the Islamic presence. There has been significant bloodshed and persecution of the Uyghurs by the Peoples Republic of China. Catalonians occupied by Spain; like Andalusia and Basque land. Circassians an unrecognized nationality within Russia. Quebecois, are the descendents of the original French colonists in Canada. When is Canada going to start their peace process towards a two state solution? Hawaiians: Hawaii was a sovereign kingdom before its state was overthrown by Americans. WHERE IS THE OUTRAGE? WHERE IS THE CRITICISM? WHERE ARE THE BOYCOTTS? OR IS OUTRAGE ONLY FOR JEWS? Post-War Europe has been doing its best to quell nationalistic expression. In the wake of Hitler and Mussolini (and Stalin, but he gets the PC pass) Europe was traumatized by the effects of pathologic patriotism. Hoping to avoid future European wars the EU project was started. The dream was to create a generic “European” loyalty shared by all the States of Europe. It is as if the differences between say Denmark and Greece were no more than those between Massachusetts and Mississippi. As much as our two states differ from one another their citizens share a language, literature, sense of history, and culture still echoing that of the Protestant Enlightenment. Not so Denmark and Greece. Or Germany and Italy etc. The ideal of European Union becoming a “United States of Europe” demanded the destruction of nationalism and its underlying patriotism. It was to be replaced by some vague generic “Euro” identity. Only Utopians succumb to the platonic error of believing categories are actual objects to be manipulated. Reality exists ONLY in the Particular! For instance the various denominations of Euros are adorned with generic historic-looking bridges and other generic landmarks. From the Euro website they “depict the architectural styles from seven periods of Europe’s cultural history: Classical, Romanesque, Gothic, Renaissance, Baroque and Rococo, the Age of Iron and Glass, and modern 20th century architecture. All notes depict typical elements of these periods, such as windows, gateways and bridges.” TYPICAL as opposed to ACTUAL! Is this not the great platonic lie that underlies all utopian totalitarians? Europe has deliberately given itself a lobotomy and AIDS! This deliberate demand to NOT SEE particularities will prevent Europe from seeing her fate: Not See its fate. The full circle from Nazi ideology to NOT SEE ideology will destroy the new Europe. Is Europe fated to be either Nazi or to Not See? Regardless of the chances of beating the Democrat nominee, which of the Republican nominees if elected would be most likely to significantly change America in a positive way. 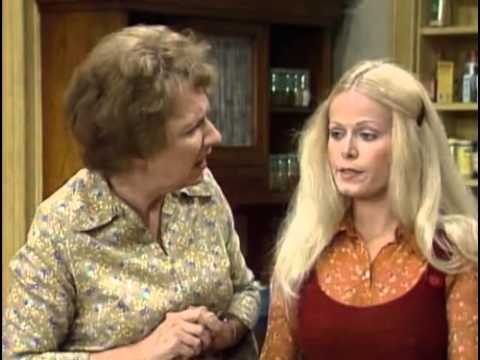 All In The Family: a Socially Conservative Show? Entertainment Weekly reported Norman Lear’s comments at the Television Critics Association’s press tour in Beverly Hills. The 93 year old producer of All In The Family,The Jeffersons and One Day at a Time (and I believe Maude and its spinoffs) announced that he is a “social conservative”. Many of us who grew up watching those shows see in them the seeds of the Culture Wars that America is losing today. To read that he considers himself a social conservative was almost as shocking as reading that DW Griffith was a crypto-anarchist. After pondering Norman Lear’s comment and recalling his trademark shows I think I can rectify his social conservatism with the content of his productions. NORMAN LEAR is a social conservative!!!?? Did he change? Or was Meathead supposed to be equally as wrong as Archie? If so, the writers totally blew it over the years. Because Stivik, the know-it-all university student who married Archie’s daughter and moved into his house and ate his food and looked down on him as only a leftist could, was portrayed not as equal and opposite to Archie. No, it appeared to me back then that he was supposed to be superior to Archie. He was used to teach us what educated and “with it” young adults were like. The synthesizer of thesis -antithesis was either Gloria or Edith. All the feuds instigated by the politico-cultural polarities of the two men created stress between the women. And their contribution was LOVE. So in a way, though Bunker, a “typical” blue-collar WASP was cast as “reactionary” and racist, he also had a sense of fair play. 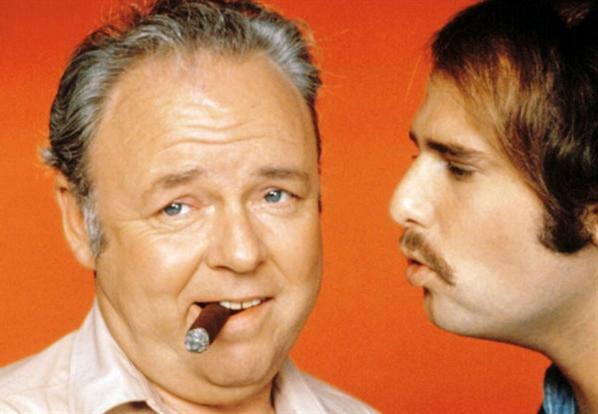 Michael (Meathead) was cast as a self-righteous know-it-all, who somehow was portrayed as “car~ing” (Michael Savage snide tone implied). The inevitable clash between the two men was also portrayed as being inflated by male ego. Thus the beginning of the dumbing down of the TV male (hetero) had begun. 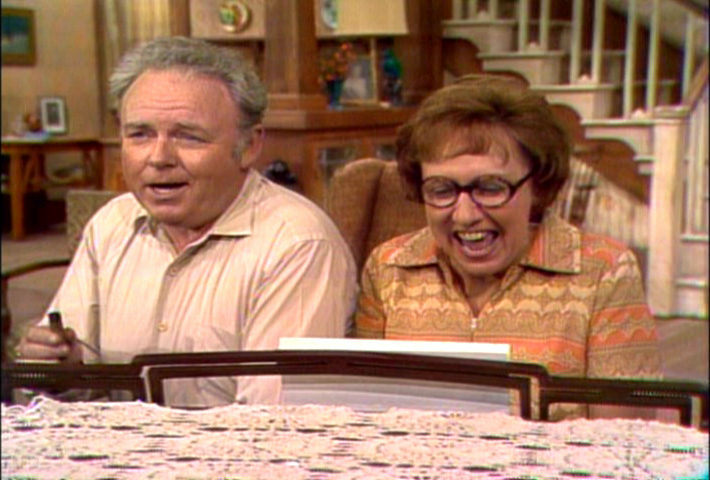 And yet… despite the overall radicalism of the show Norman Lear included the key component in society: the subtext of FAMILY LOVE. It is (or was) his recognition of family love as the mortar that holds society together despite political differences that should have allowed us to see Lear as a cultural conservative. Rather than being shocked and thinking “too little too late” we might have understood that all along he was showing the way; the Conservative way. The Conservative Way is NOT political. Though Conservatives take part in politics, it is typically in a manner to resist the politicization of culture. For instance Marriage is NOT supposed by Conservatives to be a political issue. As Lockeans have always maintained, humans in the State of Nature are not atomized beasts, but rather are social creatures. The Bunker family home is where they lived. The issues of the day were out there. But inside, though the issues had their echoes, the reality was that their world was higher than mere politics.